Welcome to the Crusader Crux where we get to check into the lives of Mayer Lutheran High School alumni and see firsthand what God is up to in their lives. Today’s alumna is Paige Roberts. She is a 2011 graduate of Mayer Lutheran High School. She currently lives in New London, MN where she is a herdsman for Jer-Lindy Farms in Brooten. Her parents are Tom and Robin Roberts. 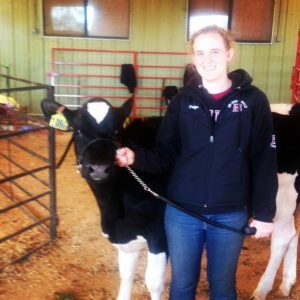 With her Bachelor of Science in Agriculture Studies with an emphasis in Animal Science from the University of Wisconsin River Falls, Paige Works with all things dairy at the farm. One of the many important skills that God has graced her with is the ability to care for the cows. “I really enjoy the fact that am helping feed the world by providing a wholesome nutritious product. It could be cheese I helped make or the milk we drink! I also like working with the cows. They are very friendly and entertaining creatures and it’s amazing to see how they can produce a valuable food product for us! The hardest part is when a cow or calf is sick and you do everything in your power to help her feel better but nothing you do works. “My day starts at 5 am when I walk in on the barn to get ready to milk the cows. We milk about 180 Holstein and Brown Swiss cows. On days we are making cheese the milk is taken straight from the cow and piped to the on farm cheese plant. Milking is usually over around 8am when I move onto my next task for the day, which could involve anything from feeding baby calves, taking care of sick cows, walking pens to do a quick check up on all the cows, giving vaccines, working with the vet, or operating machinery. Clearly, Paige is a busy servant. Mayer Lutheran High School has helped in preparing her faith and mind for truly unique work. Attending Mayer Lutheran High School really shaped Paige into the helpful person she is today and she gives God the Glory to have the opportunities that she has to take care of His creatures. A favorite quote from Sylvain Reynard gives her the courage to keep up the hard work; “You know feeding someone is the ultimate act of care”. Thank you, Paige, for showing us how to put God’s work first in our lives.